Since arriving in Hollywood, Sheaun McKinney has built an impressive career encompassing both comedy and drama. 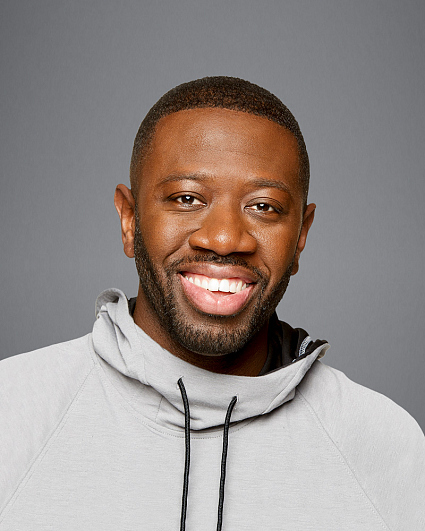 Before joining THE NEIGHBORHOOD, he co-starred on the series “Vice Principals,” opposite Danny McBride and Walton Goggins, and received critical acclaim for his role as Karvel on “Snowfall.” Additional TV credits include a recurring role on the comedy “Great News,” executive produced by Tina Fey, as well as guest appearances on “Burn Notice,” “Common Law,” “Graceland” and LIFE IN PIECES, on the Network. Born and raised in Miami, McKinney had dreams of football greatness until he discovered performing. In high school, he formed the rap group 3 in Da Clip with friends, and while attending Miami-Dade College, he began to pursue theater, quickly landing a scholarship and eventually becoming president of the campus theater club. McKinney went on to co-found a theater company, Ground Up & Rising, with classmate and fellow actor Bechir Sylvain and actor/writer Arturo Rossi. As part of a group of artists called Urban Disturbance, McKinney performed improv, stilt-walking and aerial work throughout south Florida. After moving to Los Angeles, McKinney partnered again with Sylvain to create, write and produce the web series “Make It Happen,” which won the audience award at the Short Cuts Film Festival. McKinney can be seen next on the big screen in the sci-fi thriller “Boss Level,” directed by Joe Carnahan and starring Mel Gibson and Naomi Watts. When McKinney isn’t on set, he can be found rooting for his favorite sports teams—the Miami Dolphins, Hurricanes, Marlins and Heat—or working in the kitchen to perfect his French toast. His birthday is July 24. Follow him on Twitter @sheaun305 and Instagram @sheaunmckinney.